While you just can’t go wrong with ice cream (however in saying that, we have seen images of vegemite ice cream making the rounds – two words: please don’t), we can’t deny wistfully gazing at the rainbow paddlepops whenever we’re going for an icy treat and reliving our childhood dreams. 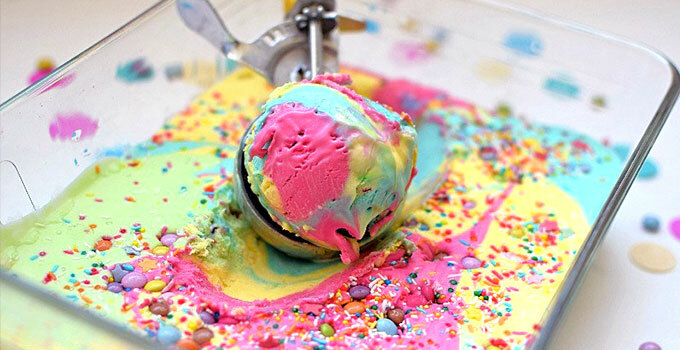 Keep your inner kid happy with this delectable rainbow ice cream recipe that the talented Nate from Creamish has whipped up. Whip cream until stiff peaks form in a separate bowl. Fold condensed milk into the whipped cream. Scoop the ice cream into a container one colour at a time and mix into a pattern that you like. Top with sprinkles and any candy you enjoy, for example M&Ms.